WestJet’s 2015 Christmas Miracle campaign snagged one more unexpected miracle: unprecedented traffic to their website courtesy of social media aggregation platform, Hashtagio. Hashtagio, a Canadian-based social media aggregation platform, released the staggering results of the 2015 campaign in a case study, to help educate travel marketers on best practices in user-generated content marketing. WestJet aggregated and categorized “mini-miracles” pulling in content from Twitter, Facebook, Instagram and YouTube, tagged with the Hashtag #WestJetChristmas to create a “mini miracles social hub” on their blog. This encouraged user engagement with the brand directly on their website, instead of relying on just the social networks themselves to showcase the campaign. The WestJet case study provides an evidence-based case for leveraging user-generated content on the brand website to increase customer engagement and SEO visibility, and to provide direct links that guide visitors along the path to conversion. 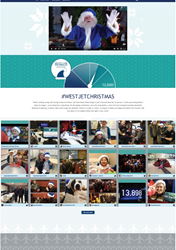 You can download a copy of the WestJet Social Media Marketing Campaign Case Study, here. This latest case study is one of a growing number of success stories Hashtagio has published on integrating user-generated content at the point of conversion. To see Hashtagio in action, click here. Once content is imported into the social hubs, brands can organize and categorize social stories by location, experience, or product type. On the backend, there is a user-friendly interface that shows all available social content pulled from each channel based on the brand’s keywords, hashtags and verified social media accounts. Hashtagio can be integrated with most website platforms, plugs into Google Analytics to measure ROI, and offers advanced social analytics and sentiment analysis.